Tax returns now include questions and forms related to the Affordable Care Act (ACA). All taxpayers need to report on their health insurance coverage, and some need to complete new tax forms or worksheets to claim an exemption from the coverage requirement, or calculate the penalty for not having coverage. Additionally, those who received advance payments of the premium tax credit to purchase insurance in a Health Insurance Marketplace will need to reconcile the payments they received with their final premium tax credit, which is calculated on the tax return. 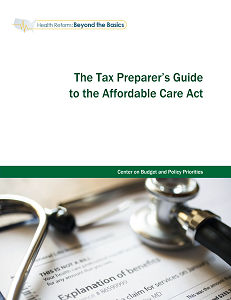 To help tax preparers understand how the ACA affects tax preparation, the Center on Budget and Policy Priorities developed “The Tax Preparer’s Guide to the Affordable Care Act.” The guide provides basic information about the new tax forms, as well as examples and practical tips on how to approach the ACA-related sections of the tax return. It explains coverage under the ACA, how the ACA changes the tax return, the requirement to maintain minimum essential coverage, exemptions to the coverage requirement, how to calculate the penalty for not maintaining minimum essential coverage, and how to reconcile advance payments of the premium tax credit with the final premium credit amount.